President Lyndon Johnson (LBJ) is one of only four people to have held all four elected federal offices, namely US Representative, US Senator, US Vice-President and US President. As President he is perhaps best remembered for escalating involvement in the Vietnam War, and for his “Great Society” legislation. John F. Kennedy was the 35th President of the US, and the fourth US president to have been assassinated in office. The previous three presidents who were killed in office were Abraham Lincoln, James Garfield and William McKinley. The name “kangaroo” comes from the Australian Aborigine term for the animal. There’s an oft-quoted story that James Cook (later Captain Cook) asked a local native what was the name of this remarkable-looking animal, and the native responded with “kangaroo”. The story is that the native was actually saying “I don’t understand you”, but as cute as that tale is, it’s just an urban myth. In Shakespeare’s “Hamlet”, Polonius is an important character eventually killed by Hamlet, albeit in a case of mistaken identity. Polonius has two memorable lines in the play, oft-quoted today. “To thine own self be true”, and “Neither a borrower nor a lender be”. Delihah is a Biblical figure, the wife of Samson. Delilah was engaged by the Philistines to betray her husband by determining the secret of his great strength. Samson lied to his wife three times, but on the fourth asking he told his wife the truth, that he did not cut his hair. Delilah then convinced Samson to shear his locks, and so allowed him to be captured by his enemies. Over the centuries, it has been usual to depict Delilah actually cutting off her husband’s hair, but the Bible actually says that she persuaded Samson to do the job himself. Phi is the 21st letter of the Greek alphabet. The American Dental Association (ADA) is the largest and oldest national dental association in the world. Today the ADA is based in Chicago, but the association was founded in Niagara Falls, New York in 1859. The ADA started out as a group of 26 dentists and it now has more than 152,000 members. A gene is a section of a chromosome that is responsible for a particular characteristic in an organism. For example, one gene may determine eye color and another balding pattern. We have two copies of each gene, one from each of our parents, with each copy known as an allele. Milo O’Shea is a great Irish character actor from Dublin, who has appeared in everything from “Romeo and Juliet” to “The West Wing”. In the UK, something “twee” is cutesy or overly nice. “Twee” came from “tweet”, which is the cutesy, baby-talk way of saying “sweet”. The degree of Bachelor of Fine Arts is primarily designed for students intent on pursuing a career in the visual or performing arts. The Supra was a sporty car made by Toyota from 1979 to 2002. The Spura was in effect a longer and wider Celica. Lithography is a printing technique that was invented in 1796 as a cheap way to publish theatrical works. In the litho process the image is drawn on a metal plate, although originally it was drawn on a stone (hence the prefix “litho-“). The image is drawn in such a way that some regions of the plate repel ink, and then when paper is applied to the plate, those areas are ink-free. Chase Utley is a second baseman who currently plays for the Philadelphia Phillies. Chichén Itzá is a Mayan ruin located in the Mexican state of Yucatán. It is the second most visited archaeological site in the country (after the ancient city of Teotihuacan). Chichén Itzá has seen a surge in the number of visitors since the development of nearby Cancún as a tourist destination. The name “lira” is used in a number of countries for currency. It comes from the Latin word for a pound and is derived from a British pound sterling, the value of a Troy pound of silver. The lira (plural “lire”) was the official currency of Italy before the country changed over to the euro. Canadian actress Ellen Page came to prominence playing the female lead in the 2007 hit film “Juno”. Page also played the female lead in one of my favorite films of the past few years, 2010’s “Inception”. Tim Tebow is a quarterback playing for the Denver Broncos. Tebow was the first college sophomore to win the Heisman Trophy. The heart has four chambers. The two upper chambers (the atria) accept deoxygenated blood from the body and oxygenated blood from the lungs. The atria squeeze the blood into the two lower chambers of the heart (the ventricles), “priming” the pump, as it were. One ventricle pumps deoxygenated blood to the lungs, and the other pumps oxygenated blood to the rest of the body. The largest denomination within the Muslim faith is Sunni Islam, with the second largest being Shia Islam. These days, a dealer in a casino usually deals cards from a shoe. The shoe has only been around since 1961 when it was invented by magician John Scarne. The dealing device is so called because early versions resembled a woman’s high-heel shoe. Ultimately our word “dais” comes from the Latin “discus” meaning a “disk-shaped object”. Dame Edna Everage is the outrageous character created and played by Australian comedian Barry Humphries. I saw him/her perform live in a San Francisco theater, and what a great show it was. Lake Erie is the fourth largest of the five Great Lakes (Lake Ontario is the smallest). The lake takes its name from the Erie tribe of Native Americans that used to live along its southern shore. Erie is the shallowest of the Great Lakes, something for which nearby residents must be quite grateful. Being relatively shallow, Erie freezes over part way through most winters putting an end to the lake effect snow that falls in the snow belt extending from the lake’s edge. Toledo, Ohio lies in the northwest of the state, at the western end of Lake Erie. The city was founded as a result of the prosperity that hit the area when the Miami and Erie Canal was constructed in the 19th century to connect Cincinnati to the Great Lakes. 40. Woeful words from Winnie the Pooh OH, BOTHER! A. A. Milne’s “Winnie-the-Pooh” has been translated into many languages, and is one of the few modern titles for which there is a Latin version. Alexander Lenard had “Winnie ille Pu” published in 1958, and two years later the title made it onto the New York Times Best Seller List, the only book in the Latin language ever to get that honor. The plant known as the oxlip is more properly called Primula elatior. The oxlip is often confused with its similar-looking cousin, the cowslip. The Shih Tzu is one of the oldest breeds of dog, and originated in China. Shih Tzus have long hairy coats but they don’t shed. 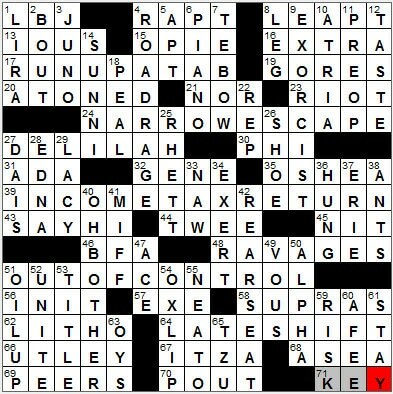 How do I find the crossword answers now? What do I click? Always in the past there was no problem, now I’m blocked by this comment page. Can you adjust the site so I see what I’m looking for? Help me get the puzzle and answers itself. Thanks. Your puzzles are beyond ridiculous! Not even worth attempting anymore.